Information on carpets and BCF, the yarn for carpet production. floats in water. Burns to a round hard tan bead. dissolves in hot meta-cresol. Burns rapidly to a round hard bead and gives off a pungent odor. excellent resistance to mildew and aging. Prolonged sunlight can cause degradation. Good resistance to all three. Damaged by sunlight, mildwe, moths, beetles. Sunlight can cause yellowing. Synthetic yarns arrive at the carpet manufacturer either in staple fiber form or bulk ontinuous filament (BCF) form. The staple fibers, which on average are 7 inches (18 cm) long, are loose, individual strands that arrive in bales. Several bales are blended together into one batch in a hopper. Then, after lubrication, they are spun into long, loose ropes called slivers by a carding machine. The slivers are then pulled, straightened, and spun into single yarn that is wound onto spools. Both the single-ply staple fibers (now spun into filament) and the bulk continuous filament must now be twisted together to form thicker twoply yarn suitable for tufting. The yarns are then steamed to bulk them, and then heated to 270-280°F (132-138°C). This heat setting causes the yarn to maintain its shape by fixing its twist. After cooling, these yarns are wound onto tubes and transported to the tufting machines. Most carpets are dyed after tufting, yet sometimes the yarns are dyed first. The methods include putting 500-1,000 pounds (227-455 kg) of fiber into pressurized vats through which treated dyes are circulated, or passing the fiber continuously through the bath, or passing skeins of yarn through the vat of dye. The yarn can also be put on forms, and the heated dyes can then be forced under pressure from inside the forms to color the yarn. Another method passes the yarn through printing rollers, while yet another involves knitting the yarn onto a form that is then printed with dyes before the yarn is unraveled. All yarn that has been dyed is then steamed, washed, and dried. The yarn is put on a creel (a bar with skewers) behind the tufting machine, then fed into a nylon tube that leads to the tufting needle. The needle pierces the primary backing and pushes the yarn down into a loop. Photoelectric sensors control how deeply the needles plunge into the backing, so the height of the loops can be controlled. A looper, or flat hook, seizes and releases the loop of yarn while the needle pulls back up; the backing is shifted forward and the needle once more pierces the backing further on. To make cut pile, a looper facing the opposite direction is fitted with a knife that acts like a pair of scissors, snipping the loop. This process is carried out by several hundred needles (up to 1,200 across the 12 foot [3.7 ml width), and several hundred rows of stitches are carried out per minute. One tufting machine can thus produce several hundred square yards of carpet a day. For solid color carpeting, carpet of several standard roll lengths is sewn together to make a continuous roll, which is then fed into a vat. The vat is filled with water, which is first heated before dyes and chemicals are mixed in. The mixture is then slowly brought to a boil and cooked for four hours. Another method of making solid color carpet is to sew several rows together to make one continuous roll, which is then fed under rods that bleed the color into the pile. 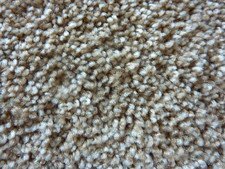 After dyeing, the carpet is then steamed to fix the color, excess color is washed off, and the carpet is dried and put on a roll. To make printed carpet of various designs, white carpet passes under screens in which holes in the desired pattern have been cut. The desired color is squeegeed through the holes in the screen, and the carpet is advanced 36 inches (91 cm) to a different screen that applies a new color in a different design through the screen. Up to eight colors can be applied with this method. Another method of dyeing printed carpet is to pass it under embossed cylinders that have raised portions in a design, which press color into the carpet. Each cylinder provides a different design for a different color. After dyeing, the printed carpet is steamed, excess dyes are washed off, and the carpet is then dried and put onto rolls to go to the finishing department. The ends of the dyed carpet are first sewn together to form a continuous belt. This belt is then rolled under a dispenser that spreads a coating of latex onto the bottom of the carpet. The completed carpet is then steamed, brushed, vacuumed, and run through a machine that clips off any tufts that rise above its uniform surface. The carpet is then rolled into 120 foot (37 m) lengths that are then packaged in strong plastic and shipped to either the carpet manufacturer's inventory warehouse or to a retail carpet store. CONTACT US for more information or if you are interested in yarns for carpets.